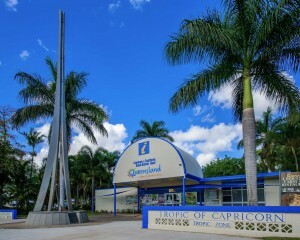 The Tropic of Capricorn is one of Earth’s major circles of latitude. It lies 23.5 degrees south of the equator and marks the most southerly latitude at which the sun can appear directly overhead at noon. Running through Australia, Chile, Southern Brazil, and South Africa, it links extreme conditions and dramatic landscapes. Experience the living museum these ancient events left behind: a country embedded with mineral wealth, tell-tale fossils, and inspiring landscapes. 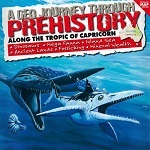 Explore the Tropic of Capricorn and discover the secrets of the ages in the treasures atop and layers below. Sweeping through Queensland, the Tropic of Capricorn reveals a host of geological wonders showcasing the results of drastic climate change over times. Take a geo journey back to Gondwanaland, when Australia was part of a colossal southern continent crawling with extraordinary creatures. As the earth shifted in a gradual, sensational, evolution of the land, Queensland edged closer to its current position along the Tropic of Capricorn. Australia’s vast inland sea and its surrounding wetlands disappeared, leaving behind a prehistoric burial ground in the vast plains of the Outback. Today you can experience the legacy of Australian dinosaurs and marine reptiles at Boulia’s Stone House Museum, the Australian Age of Dinosaurs Museum at Winton, and the Lark Quarry Conservation Park. The sediments of this sea and vegetation now provide Queensland’s Tropic of Capricorn with invaluable groundwater and mineral supplies. Experience the Great Artesian Basin at the Ilfracombe Mineral Spa, and learn about the transformation of coal at the Blackwater International Coal Centre. Global drying and brutal erosion over the following millennia carved mesas and jumpups, such as Cawnpore and Starlight’s Lookout, out of the Outback flats. Geological forces from the east and harsh weathering sculpted the dramatic gorges and escarpments of Blackdown Tableland. Volcanic eruptions and environmental effects gradually produced the treasures of the Tropic- precious gemstones of the Sapphire Gemfields, the boulder opals of Opalton, Mt Hay’s thundereggs, and the gold of Mount Morgan. Further volcanic activity and a sinking coastline transformed the Capricorn seascape, leaving behind rocky outcrops and a host of conspicuous plugs. The twin peaks of Yeppoon’s Double Head and the scenic Bluff Point, tell us of this incredible past. Folding of the earth’s crust lifted and cracked the region’s limestone, and rainfall eventually crafted the labyrinth of limestone caverns found at the Capricorn Caves. The Tropic of Capricorn showcases the results of an incredible geo journey that has seen species irradiated, sceneries transformed, and time buried in layers and folds. What remains is a living museum, a country embedded with great mineral wealth and tell-tale fossils. Discover spectacular landscapes that whisper of another world- reminding us that true beauty does indeed come from beneath.